The sustainability strategies listed here should be incorporated into all phases of programme design and implementation, from the beginning. Safe cities for women programme partners should always work towards creating long-term programmes, actions, initiatives and/or projects that women and others can depend upon, with strong links throughout the community. Remember to think about long-term and short-term human, technical and financial resources. Safe cities for women programmes may run out of money and other resources before they complete their activities. This can be frustrating for all partners and lead to disappointment throughout the community. Programme partners should remember that many governments may fund short-term pilot projects, but may not necessarily provide sustained or “core” longer-term funding, especially if administrative procedures or fiscal priorities change over time. This occurs because governments can announce new pilot projects frequently, which generates positive publicity, but longer-term and larger-scale efforts require more significant funds. Safe cities for women programme partners should be aware of these realities if they are funded for a pilot project, so as to strategize on how to continue their work on a longer-term scale. One way is to apply to a variety of different funding sources. Another strategy is to advocate for policy and legal reforms to institutionalize political attention to the issues, and for the inclusion of the safe cities for women programme as item/s in the annual budget of the municipal government and/or other organizations and sectors. Prioritize what is most important to accomplish. Safe cities for women programme partners should look carefully at each objective they ant to accomplish and the amount of resources required. Sometimes, smaller, relatively inexpensive actions will promote the goals and objectives of the programme more than large, expensive actions. If this is the case, then the smaller, more appropriate action should receive top priority. Alternatively, there may be several large, expensive actions that partners would like to undertake. It may not be viable to do these all at once. If this is the case, partners should go back to their results framework and decide which action is most likely to contribute to the achievement of their goals and objectives. Try to be realistic about resources. Safe cities for women programme partners need to be realistic about what they can actually achieve using the resources that they can obtain. Partners should not launch programmes, activities, initiatives or projects that they will not be able to finish – the result will be disappointment for both partners and the community at large. Also, if a safe cities for women programme runs out of resources and disappears, it could discredit the concept of safe cities for women in the public eye. Set up mechanisms to review resources. When allocating resources, programme partners should frequently check back and adjust their strategies and approaches so that they are able to carry out the most effective programs, activities, initiatives or projects that they can. This is not a one-time process. The partner(s) who are responsible for managing resources should repeatedly review the resources assigned to each action in order to make sure that resource estimates and budgets are correct and that each partner is contributing what they said they would. Identify resource mobilization opportunities and be creative. In addition to resources already committed by partners, including resources that might be available from governments at national, regional, and municipal levels, there also may be funding from local business organizations or larger corporations, as well as donors concerned with gender equality, violence, governance and urban planning.Funding opportunities will depend on the location and the focus of each individual safe cities for women programme. Human and technical/expert resources can come from many different places, as well as in-kind (non-monetary) contributions. Human resources can come from volunteers, including elderly people and young people, who may have extra time on their hands. Sharing office space and supplies with a like-minded programme or organization may be a viable option to cut costs; governments can provide access to free public spaces and conference rooms for events; local media houses or radio stations committed to gender equality can assist with press conferences; universities can establish internship programmes for students to exchange their time for useful work experience or research on a safe cities for women project; local businesses can donate services, from photocopying to the expertise of advertising companies for prevention campaigns; and so forth. See the building partnerships section for more information. 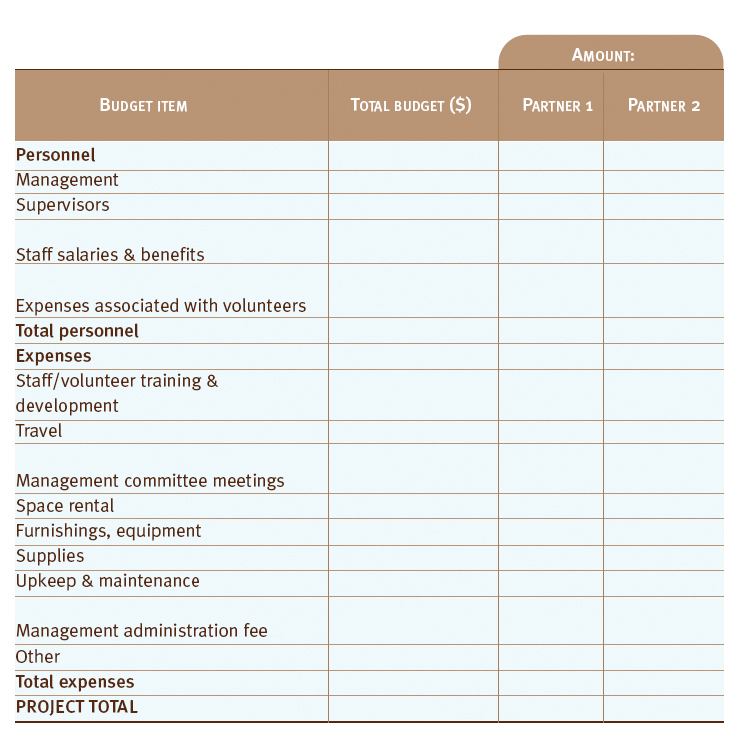 Project Budget in Building Community-Based Partnerships for Local Action on Women’s Safety (Women in Cities International, 2007). Women in Cities International/Femmes et villes international, Canada: page 30. This project budget can be used to monitor the financial commitments of each partner in a safe cities for women programme, activity, initiative or project. Available in English and French. Women Thrive Worldwide Fundraising Guide for Women's Community-Based Organizations (2010). This guide, produced by Women Thrive, offers guidance on fundraising for actors working in women's community-based organizations, particularly in developing countries. The information provided in the guide can be used by women's groups looking for resources to start their own safe cities for women initiative. Advice is given on multiple facets of fundraising, including building relationships with potential donors, looking for several funding sources, and applying for grants. Available in English.